By hrynyshyn on July 19, 2017. How many kids should you have? Used to be the answer was "none of anyone's damn business." But that's not the approach a pair of sustainability experts took in a new paper that concludes the single-most powerful thing anyone can do about climate change is having fewer offspring. In "The climate mitigation gap: education and government recommendations miss the most effective individual actions" (Environmental Research Letters, 12 July 2017) Seth Wynes of Sweden's Lund University the University of British Columbia and Kimerbley Nicholas of UBC find that the greenhouse gas emissions associated with introducing a human to the planet are far larger than any other single action, especially the ones that governments and corporations keep reminding us we should be doing. 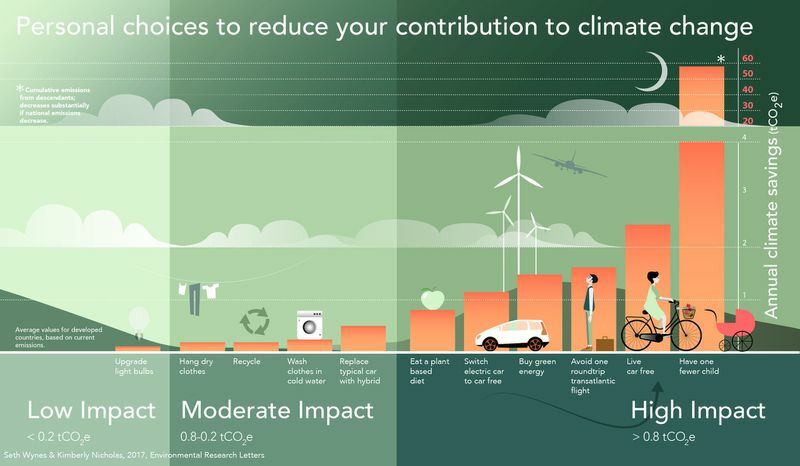 You can also live car-free, avoid airplanes, and give up meat, which are second, third and fourth on their list. "These actions have much greater potential to reduce emissions than commonly promoted strategies like comprehensive recycling (four times less effective than a plant-based diet) or changing household light bulbs (eight times less)," they write. But nothing comes close to smaller families. By averaging out the impact of a developed-world child into one single figure, the study obscures the single most salient fact about individual carbon emissions, namely that wealthy people produce way more. That’s true not only between countries but within them as well. Where Impact is the product of the size of the Population, the Affluence of the population and the resource intensity of the Technologies involved in maintaining the population. This new paper is really just a reminder that we have to think about all three if we want to change our global-warming trajectory. So sure, have fewer kids. There's no doubt that that will make a difference. But so will buying less stuff, which is something that rich folks may find is hard to do. And so will not burning fossil fuels. There is one important message in Wynes and Nicholas' paper that hasn't got much attention, though. "National policies and major energy transformations often take decades to change locked-in infrastructure and institutions, but behavioural shifts have the potential to be more rapid and widespread." Meaning less time behind the wheel can occur right away, while electrical power plant designs take decades to change. It is especially important that adolescents are prepared for this shift. They still have the freedom to make large behavioural choices that will structure the rest of their lives, and must grow up accustomed to a lifestyle that approaches the 2.1 tonnes per person annual emissions budget necessary by 2050 to meet the 2 °C climate target. The typical carbon footprint of an American is approximately 10 times the target Wynes and Nicholas mention. So that's a lot of behavioral shifting. But if you do have kids, and you instill in them (preferably by example) the need to cut their A and T factors, then perhaps your contribution to P won't be quite as problematic. Promising Bipartisan Proposal in Congress to Deal With Climate Change.. REALLY! Interesting that this article got zero comments until now. Difficult subject that it is: "nobody's going to tell ME (emphasis on "ME") what to do." Particularly where instincts honed over the entire history of life on earth (reproduction) run smack into reality. None the less, there it is. Your "precious genes" mean nothing if humanity faces extinction.